Riding a dominant pitching performance by junior starter Levi MaVorhis, K-State baseball (16-18, 4-8) was able to take the rubber match from No. 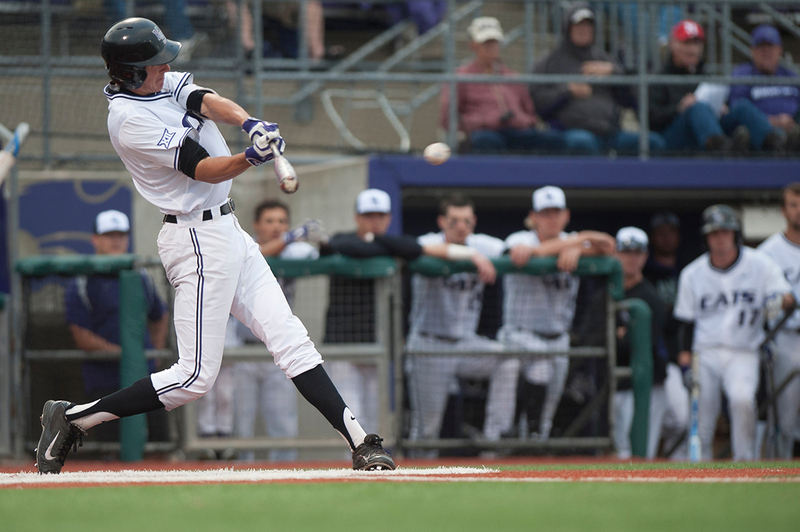 3 TCU 6-2 on Sunday at Tointon Family Stadium in Manhattan to win their first series since Easter weekend 2014. MaVorhis pitched seven innings of shutout baseball before being pulled in the eighth inning after putting two men on with one out. While MaVorhis was dominant, it was less about striking out hitters and more his control to get TCU’s batters to hit into K-State’s excellent defense, which recorded three double-plays on the day. “As a guy who doesn’t throw 95 (mph), I just wanted to pitch to contact and live low and hopefully (the defense) can get some ground balls,” MaVorhis said. K-State was able to get on the board first in the third inning as junior infielder Jake Wodtke reached home on junior infielder Tyler Wolfe’s groundout to take a 1-0 lead. The Wildcats were able to widen the gap even further in a four-run fifth inning, which featured senior outfielder Max Brown bring two runs in on a triple and almost turning it into a infield home run before getting tripped up and the tagged out between third and home. In addition to Brown’s two RBI’s, Wolfe, who led the team with three RBI’s on the day, was able to drive in a run on a fielder’s choice. Senior infielder Shane Conlon also flew out to center field to help score a run. The Wildcats might as well have left their bats in the clubhouse, as the Horned Frogs and their ace Trevor Morrison shutout K-State 9-0. It was Morrison’s second-career complete game. K-State only had six players get on base in the entirety of the game (four hits, two walks). K-State was able to start the series on a high note, winning the first game 14-4. Despite the final score, the Wildcats started the game in a hole down 2-0 in the first inning. K-State didn’t stay behind for very long, as the team exploded in the first inning to score seven runs on six hits. The Wildcats were then able to put up multiple runs in both the fourth and the eighth innings, as Brown led the way for K-State with four RBI’s. K-State takes on Wichita State in a midweek game on Tuesday at Tointon Family Stadium. First pitch is slated for 6:30 p.m.